Healthy jawbones are an important starting point for dental implants. Implants are essentially bridges that are anchored permanently into your jaw to ensure a comfortable and sturdy fit. Implants are considered the treatment of choice for replacing dentures that don’t fit quite right, and for replacing missing teeth. If you have ill-fitting dentures or missing teeth that make chewing food painful and smiling less than comfortable and you want natural looking, healthy alternatives to your old dentures, Dr. Robert J Meisner can make your dreams for permanent, sturdy dentures a reality. If tooth loss or bad dentures have left you with a lack of confidence and feeling less attractive, dental implants may be the answer to regaining the smile you once had. If you find yourself gravitating toward soft food because chewing is uncomfortable, dental implants may be the solution to regaining your ability to eat any type of food you’d like. It used to be that implants were considered a last resort. Now, they are the treatment of choice. Dr. Meisner has been performing implants since 1982 and during that time his office has grown to be one of the premier implant dentistry practices in Western New York. If you have jawbone ridges that are in good condition and oral tissues that are healthy, you are a perfect candidate for this procedure. The beauty of dental technology coupling with your body’s natural instinct to adapt to keep you healthy, is that once the chemical and mechanical bond is formed between the implants and your jawbone, the two begin to grow together, giving your body the healthiest way to experience a younger, more natural smile. Made of titanium, dental implants replace the root of a tooth that has been lost. By surgically implanting these titanium constructs into the jawbone, a process called ossoeintegration occurs between the jaw and the implants that actually fuse the two. Within six months of the procedure, the two are completely joined, making dental implants all the more natural and comfortable. Once a patient is completely healed from the procedure, these implants are used to anchor dentures. This makes dental work much more permanent, and effective, eliminating the possibility of repeating procedures over and over as time goes on. First and foremost, patient health and wellness is considered when reviewing a candidate for this procedure. An in depth review of not only dental, but medical records are done by Dr Meisner and his highly trained staff to ensure this is the best alternative for you. After this process has been completed, X Rays, and thorough examinations of the missing tooth area are conducted. Methodical and experienced, it is of upmost importance to Dr Meisner that you are treated specifically according to your needs and goals for oral health. Once an all encompassing treatment plan is formulated, implants can be put in. Local anesthesia is used and the implants are placed carefully under the jawbone. 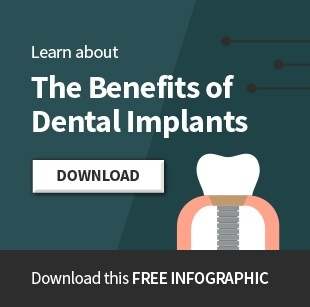 Once the healing process is complete, implants are ready to be an anchor for crowns, dentures and bridges. Yes, there are several types of Dental Implants available. Because each patient is unique and has specific needs, there are a variety of options. The American Dental Association considers both endosteal and subperiosteal implants to be acceptable. The most important factor when considering dental implants is the health of the jawbone, and whether or not it is capable of supporting the implant. The most common implant used by our office and, more broadly, the members of the American Dental Association is the endosteal root form fixture implant. Dr. Meisner finds this to be especially beneficial to patients because it is most similar to a man-made tooth root, and therefore feels more natural. Dr. Meisner says, “If someone asked me what’s better – a fast paced practice, or a realistically paced practice, clearly, it’s a realistically paced practice. And I think the public is done a great disservice with these promises of quickie dentistry. There is no such thing as quality, longevity and health in the same sentence as “quickie dentistry.” It’s just not a possibility. For example, it takes a certain amount of time for the body to heal. So if you’re going to treat periodontal disease, or gum disease, there’s a healing period that’s involved, you can’t rush that. There’s a lot of advertising out there for so called, ‘teeth in a day.’ And the reality is that although SOMETIMES you can do that, you have to let the body heal. Bone matures in four to six months. Not before that. If someone were to come in and do a complete cosmetic makeover with makeup, in the next day or so I might look at that and say, I don’t know, I think I might like it a little more this way or that way. Well, aesthetic dentistry is the same way, you go in there and you can change things. But then you give it a little time to settle in. And then you say how do we make that better? Do we change that angle, do we alter their proportions. And all of that is part of the process of doing really, really fine, long lasting dental care. What Choice is Best for Me? “In our world today, there’s a tendency to make everything quick and easy. Almost a little frivolous? We have all seen the dental practices advertising with bouncing teeth on the sidewalk. And slogans and jingles. These retail phenomenon that have been used to sell everything from bicycles to sneakers to slinky toys, have a tendency to downplay the fact that what we do in dentistry is serious business. Everyone in the entire office are just wonderful. I have always had a good supportive relationship. I would advise anyone I know to go to Dr. Meisner. I was so embarrassed of my teeth the first day I walked in. It was needless worry because everyone I saw was so kind and reassuring that mine was not a hopeless case. I can’t wait for the final results but my mouth already feels so much healthier. Thanks so much! Personable and always professional. I can count on high quality care for me and for my children. Thank you! I am very grateful for the amount of time the entire staff has taken to develop a dental plan for me. In my 64 years I have never had such a complete oral examination. In addition, the level of communication was extraordinary both on the medical side and the financial side. What a team! I can see why this practice was so highly recommended! Than you to all! Dr. Meisner and his team are the best! My dental work was a long process, but the outcome is amazing. I can’t stop smiling! I went to Dr. Meisner hoping he could fulfill my wishes for a fabulous smile, and he made my dream come true! I’m doing the “happy dance” every time I smile at myself in the mirror! Thank you, dr. Meisner and your fantastic staff! Love you all!